New Sewing Patterns! 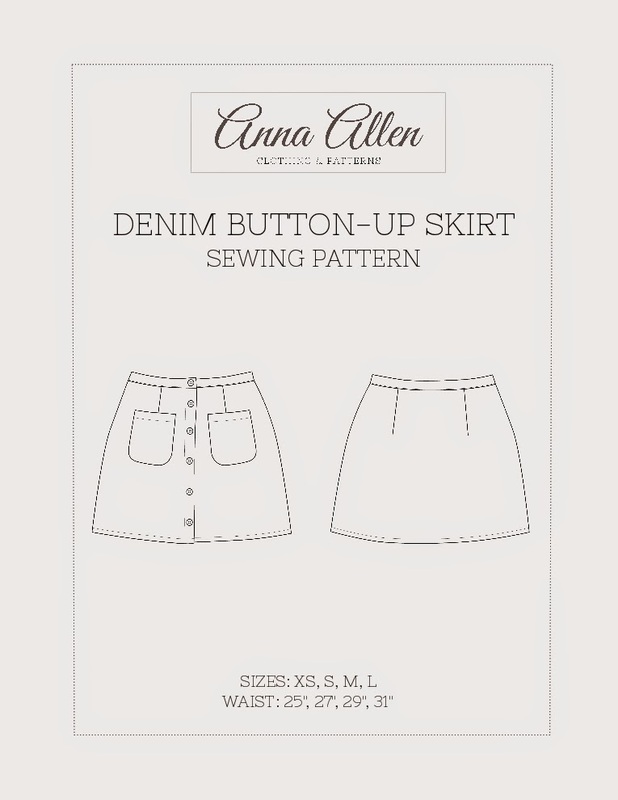 | Anna Allen Clothing Blog: New Sewing Patterns! I have been working on making my patterns available for quite a long time now and I am so happy to finally be able to share with you my very first sewing pattern! I picked a simple design to start with while I learn the ropes of creating pdf patterns. This pattern includes sizes XS-L (edit: Now available in sizes 00-20), the same size range as my ready-to-wear clothing line. I'm open to adding more sizes and would love to hear from you if you are interested in other sizes and which ones you would most like to have. This first pattern you may remember from my Fall/Winter 2012 collection and also my Spring/Summer 2013 collection. It's a basic denim button-up skirt, slim fitting and mid to high waist. I used a cotton denim with no stretch, however you could use a stretch denim if you want a little more movement in this skirt. The pattern is available in my Etsy shop HERE. I've also started a Flickr group for anyone who would like to share pictures of their finished projects using my patterns. Please let me know if you have any questions! I would love to hear from you! P.S. A little shout out to my sister Kate for creating my lovely new logo and making the line drawing for my pattern! Congratulations, Anna! I am very excited for you! Thank you! <3 I'm already halfway done with my next pattern! Love this, Anna! Congrats on a fabulous first pattern! Hi Anna, I am excited that you're getting into pattern sales, looking forward to the release of your dress patterns, any update on the time line for those?